The suspicious death of Douglas Penna. The skeletal remains of Douglas Penna, age 24, were discovered in Roxbury, NH, on April 30, 1999. 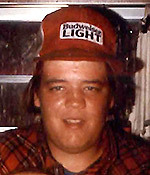 Penna was last seen on April 26, 1989. The autopsy and postmortem of Douglas's remains reveal that he died as a result of a single gunshot wound to the head. The manner of death was undetermined. The circumstances surrounding the death are suspicious.